A Mexican inventor has developed recyclable organic sports shoes made from old plastic bottles - with added seaweed, the Televisa Quintana Roo TV channel reports. Jorge Castro Ramos has been experimenting with making shoes out of old bottles for years, but recently hit on the idea of processing sargassum seaweed for the soles. "We've been dreaming of making ecological footwear for nine years now. It's taken four or five years of trial and error to make this patented Mexican fibre from plastic bottles, and then six-eight months ago we managed to make ecological organic footwear with sargassum," he told reporters in the Cancun holiday resort on the Caribbean coast. This is welcome news there, as hundreds of tonnes of sargassum have been washing up on its popular tourist beaches every year, threatening the fragile coral reefs. Mr Castro has patented the clothing-grade fibre obtained from the bottles, and received certification from the official Ciatec Centre for Applied Innovation in Competitive Technologies. But last year he began working with sargassum, eventually managing to create a sole containing 100g of the seaweed, with five-eight plastic bottles needed for the water-resistant uppers. Mr Castro reckons the shoe can last up to two years, after which owners can return them to his Renovare Ocean company for recycling. "The recycled plastic can also be used to make bags, t-shirts, leggings and sportswear, but the sargassum is just used for the soles as it contains metals that might otherwise be harmful," he told La Jornada Maya newspaper. The business community in Quintana Roo thinks the eco-shoes could help boost the local economy and improve the environment. Adrian Lopez Sanchez of the Coparmex employers federation told the TV that "talks are already underway with the hotel sector to promote the shoes to employees, and 10% of the cost of a pair could go either to clearing up the beaches, or donating shoes to children in need." This is not the first business to try to put the seaweed to practical but environmentally-friendly use. 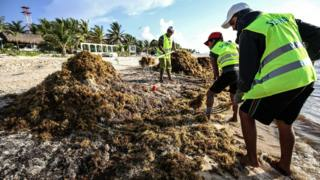 One businessman has already built three houses out of sargassum and adobe bricks in the town of Puerto Morelos, and plans to build a hotel with them in the resort of Tulum, the Riviera Maya News site reports. Omar Vázquez Sánchez told El Financiero newspaper last September that sagassum bricks could "help counteract the waste on the coast, as it can't be used for much else". He added that the Quintana Roo authorities and other local businesses are interested in using his sargassum bricks in future construction projects.